Bottom line: with Murray on fire and enough clever dialogue to rival its predecessor, Ghostbusters II is good enough to put post-milennial comedy to shame. 108 min. Columbia Pictures. Directors: Ivan Reitman, Mickey Moore. Cast: Bill Murray, Dan Aykroyd, Sigourney Weaver, Harold Ramis, Rick Moranis. People generally remember one thing about Ghostbusters II, and it's enough to make them grumble. The ending of Ghostbusters II takes the ill-advised tack of attempting to replicate and top the first film's surprise finale. Though I certainly empathize with that sequel-suspicious sentiment, Ghostbusters II is unfairly underrated, and even its ill-advised finale must be acknowledged as sort of clever. More importantly, Ghostbusters II features Bill Murray—when he still alternated mania with deadpan—at the top of his zany game. Murray reprises his role as Dr. Peter Venkman alongside Dan Aykroyd's Ray Stantz, Harold Ramis' Egon Spengler, and Ernie Hudson's Winston Zeddmore. Five years after the events of 1984's Ghostbusters, the boys have come to realize that they did their job too well, for an ungrateful city government. After being "sued by every city, county, and state agency in New York," the Ghostbusters are prohibited from paranormal investigation, so they've taken appropriate odd jobs. When Venkman's old flame Dana (Sigourney Weaver) suspects ghostly interference in the raising of her infant son Oscar, she calls on Egon for help, and soon the boys are back in action. In the process of discovering a threat to the city (psychoactive slime that feeds on the bad feelings of New Yorkers), the boys are arrested and sent before a grumbling judge (Harris Yulin). The ensuing courtroom scene is inspired chaos, with Rick Moranis' Louis returning to represent his old friends with a spectacularly inept opening argument ("Your Honor, ladies and gentleman of the audience, I don't think it's fair to call my clients frauds. Sure, the blackout was a big problem for everybody. I was trapped in an elevator for two hours and I had to make the whole time. But I don't blame them. Because one time, I turned into a dog and they helped me. Thank you. "), followed by double-act brilliance with the irreverent Venkman. Meanwhile, Dana works at the museum with creepy art restorer Janosz Poha (Peter MacNicol, blissfully working a fake European accent that's totally '80s), who becomes the willing slave to the subject of his prized painting: a 16th-century tyrant named Vigo Von Homburg Deutschendorf (Wilhelm von Homburg). Vigo wants back into this dimension, so he's set his sights on Oscar to be his vessel. Annie Potts reprises her role as the oversexed secretary Janine, now paired off with Louis. Ghostbusters II undeniably shows some of the strain of the big-budget sequel: a pointlessly redesigned "no ghosts" logo (the ghost holds up two fingers to shill for part II), kiddie-concession cameos for popular ghost "Slimer," and a soundtrack crammed with songs by RUN-D.M.C., Bobby Brown, Glenn Frey, Oingo Boingo, and Doug E. Fresh & The Get Fresh Crew that detract more than they enhance (and what is the logo supposed to mean in the context of the movie: no peacenik ghosts?). But the budget also pays for flashy Industrial Light and Magic effects (supervised by Oscar-winner Dennis Muren), production design by Bo Welch (Batman Returns), and photography by Michael Chapman (Raging Bull). Bottom line: with Murray on fire and enough clever dialogue to rival its predecessor, Ghostbusters II is good enough to put post-milennial comedy to shame. Ghostbusters fans began buzzing as the film's 20th Anniversary in 2004 approached. Rumors of a special edition reissue of the film (and sequel Ghostbusters II) swirled, particularly with the anticipation of new extras. 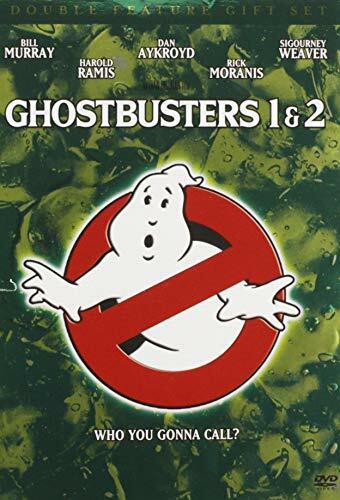 The eventually announced Ghostbusters 1 & 2 Double Feature Gift Set, released in summer of 2005, struck many fans as too little too late, but the bargain-priced set offers new transfers (generally sharper and more colorful than the initial releases) and two episodes of the Saturday-morning spinoff The Real Ghostbusters. Those two animated extras are the only ones on the Ghostbusters 2 disc (see my Ghostbusters review for details on the set's first disc)—gone are the 1999 disc's theatrical trailers and full-frame viewing option (good riddance to that one). The feature transfer is crisp and bright, and the animated shows look good for their age. "Citizen Ghost," first aired November 22, 1986, was the eleventh episode produced in the show's first season, when it was called The Real Ghostbusters (the "Real" was the result of a copyright dispute—earlier series had the rights to the name "Ghost Busters"). The second episode provided is called "Partner in Slime," and it's the series 108th, believe it or not. The show first aired October 7, 1989, after the series had been renamed Slimer! and the Real Ghostbusters, the better to exploit the Ghostbusters' hugely popular green-goblin mascot (busted in the Sedgewick Hotel sequence of the first movie). Curiously, "Partners in Slime" runs 26:18, compared to "Citizen Ghost"'s 23:45. Since the theme song sounds notably sluggish on "Partners in Slime," it's possible that episode has been accidentally slowed. "Citizen Ghost" displays the years when The Real Ghostbusters was genuinely Japanese animation, or anime, and makes reference to the events of the first film. Venkman describes, in flashback, what happened after Ghostbusters; when he failed in his responsibility to destroy the team's ectoplasm-ridden uniforms, the uniforms spontaneously created ghostly doppelgangers of the four ghostbusters. Beside addressing this little problem, "Citizen Ghost" explains how Slimer went from being just another busted ghost to the team's loveable mascot. The episode is penned by J. Michael Straczynski, who helped to develop the series and served as its initial story editor. "Partners in Slime," by Richard Mueller, represents the series under the stewardship of story editors Len Janson and Chuck Menville, who wrote the series' first and many subsequent episodes. Mueller's story finds Janine and Louis (the characters played by Annie Potts and Rick Moranis in the films) kidnapped by a gangster ghost named Boss Poso, who plans to become "the Ghostfather." To get information, the ghostbusters send Slimer into the containment unit to find one of Boss Poso's associates; there, the Stay Puft Marshmallow Man makes a cameo (in another scene, Egon refers to Vigo from Ghostbusters II). The Real Ghostbusters is kid stuff, though it will have nostalgia value for many grown-up kids. A curious array of talent assembled to produce the show, including writers genre fans will recognize: David Gerrold (Star Trek), Michael Reaves (Star Trek: The Next Generation, Batman: The Animated Series), Linda Woolverton (The Lion King, Beauty and the Beast), and Marc Scott Zicree (Babylon 5, Sliders). The original cast included Lorenzo Music as Peter (ironically, Bill Murray returned the "favor" by becoming the feature-film voice of Garfield, estabished by Music on TV), Frank Welker as Ray and Slimer (among his hundreds of voice-over roles, he's Fred from Scooby-Doo), Maurice La Marche as Egon (Futurama, "Brain" from Pinky and the Brain), and Arsenio Hall as Winston (Coming to America, The Arsenio Hall Show). In the second episode, Dave Coulier of Full House replaces Music, and Buster Jones steps in for Hall. Rounding off the set is the packaging: two slimline cases for the films share box space with a collectible, 28-page Ghostbusters Movie Scrapbook. Its design tries too hard, cluttering the presentation of photos and pre-production sketches. Still, it's a nice bonus, with a page showing the teaser, half-sheet, and one-sheet posters and a back cover that's a mock ad for Stay Puft Marshmallows. Ultimately, the Ghostbusters 1 & 2 Double Feature Gift Set must be considered a bargain, with actual prices running as low as $13 for two new film transfers and all the trimmings. All site content © 2000-2019 Peter Canavese. Page generated at 04/18/2019 04:29:51AM.